Click here for a list of older publications. Adams, N., Rayfield, E., and Cox, P.G. 2019. Functional tests of the competitive exclusion hypothesis for multituberculate extinction. Royal Society Open Science, 6, 181536. Balanoff, A.M., Norell, M.A., Hogan, A.V.C., and Bever, G.S. 2018. 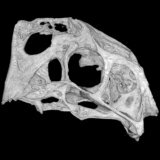 The endocranial cavity of oviraptorosaur dinosaurs and the increasingly complex, deep history of the avian brain. Brain, Behavior and Evolution, 91, 125-135. Barta, D.E., Nesbitt, S.J., and Norell, M.A. 2018. The evolution of the manus of early theropod dinosaurs is characterized by high inter- and intraspecific variation. Journal of Anatomy, 232, 80-104. Beck, R.M.D. 2017. 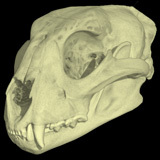 The skull of Epidolops ameghinoi from the Early Eocene Itaboraí Fauna, southeastern Brazil, and the affinities of the extinct marsupialiform order Polydolopimorphia. Journal of Mammalian Evolution, 24, 373-414. Belli, H.M., Bresee, C.S., Graff, M.M., and Hartmann, M.J.Z. 2018. 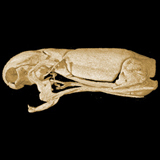 Quantifying the three-dimensional facial morphology of the laboratory rat with a focus on the vibrissae. PLoS ONE, 13(4), e0194981. Benoit, J., Jasinoski, S.C., Fernandez, V., and Abdala, F. 2017. 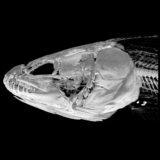 The mystery of a missing bone: revealing the orbitosphenoid in basal Epicynodontia (Cynodontia, Therapsida) through computed tomography. The Science of Nature, 104, 66. Berger, M., Li, J., and Levine, J.A. 2019. A generative model for volume rendering. IEEE Transactions on Visualization and Computer Graphics, 25, 1636-1650. Bhullar, B.-A.S., Manafzadeh, A.R., Miyamae, J.A., Hoffman, E.A., Brainerd, E.L., Musinsky, C., and Crompton, A.W. 2019. 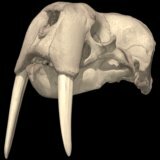 Rolling of the jaw is essential for mammalian chewing and tribosphenic molar function. Nature, 566, 528-532. Bjerke, I.E., Øvsthus, M., Papp, E.A., Yates, S.C., Silvestri, L., Fiorilli, J., Pennartz, C.M.A., Pavone, F.S., Puchades, M.A., Leergaard, T.B., and Bjaalie, J.G. 2018. Data integration through brain atlasing: Human Brain Project tools and strategies. European Psychiatry, 50, 70-76. Böhmer, C. 2017. 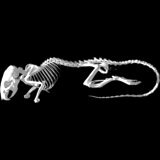 Correlation between Hox code and vertebral morphology in the mouse: towards a universal model for Synapsida. Zoological Letters, 3, 8. Bona, P., Carabajal, A.P., and Gasparini, Z. 2017. 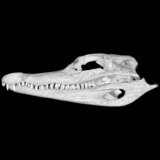 Neuroanatomy of Gryposuchus geogaeus (Crocodylia, Gavialoidea): a first integral description of the braincase and endocranial morphological variation in extinct and extant gavialoids. Earth and Environmental Science Transactions of the Royal Society of Edinburgh, 106, 235-246. Borges, R., Johnson, W.E., O'Brien, S.J.,Gomes, C., Heesy, C.P., and Antunes, A. 2018. 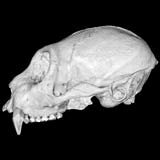 Adaptive genomic evolution of opsins reveals that early mammals flourished in nocturnal environments. BMC Genomics, 19, 121. Boscaini, A., Iurino, D.A., Sardella, R., Tirao, G., Gaudin, T.J., and Pujos, F. In press. 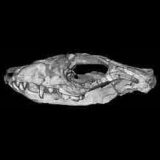 Digital cranial endocasts of the extinct sloth Glossotherium robustum (Xenarthra, Mylodontidae) from the Late Pleistocene of Argentina: description and comparison with the extant sloths. 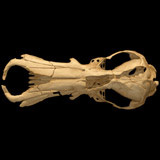 Journal of Mammalian Evolution. Brown, E.E., Cashmore, D.D., Simmons, N.B., and Butler, R.J. In press. 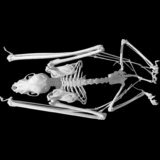 Quantifying the completeness of the bat fossil record. Palaeontology. Casares-Hidalgo, C., Pérez-Ramos, A., Forner-Gumbau, M., Pastor, F.J., and Figueirido, B. In press. 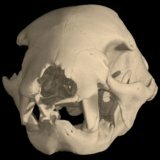 Taking a look into the orbit of mammalian carnivorans. Journal of Anatomy. Čerňanský, A., Yaryhin, O., Ciceková, J., Werneburg, I., Hain, M., and Klembara, J. In press. 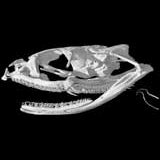 Vertebral comparative anatomy and morphological differences in anguine lizards with a special reference to Pseudopus apodus. The Anatomical Record. Clarac, F., de Buffrénil, V., Brochu, C., and Cubo, J. 2017. 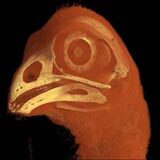 The evolution of bone ornamentation in Pseudosuchia: morphological constraints versus ecological adaptation. Biological Journal of the Linnean Society, 121, 395-408. Crompton, A.W., Musinsky, C., Rougier, G.W., Bhullar, B.-A.S., and Miyamae, J.A. 2018. 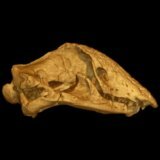 Origin of the lateral wall of the mammalian skull: fossils, monotremes and therians revisited. 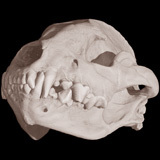 Journal of Mammalian Evolution, 25, 301-313. Csébfalvi, B. 2018. Fast Catmull-Rom spline interpolation for high-quality texture sampling. Computer Graphics Forum, 37, 455-462. Da Silva, F.O., Fabre, A.-C., Savriama, Y., Ollonen, J., Mahlow, K., Herrel, A., Müller, J., and Di-Poï, N. 2018. 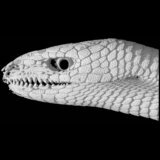 The ecological origins of snakes as revealed by skull evolution. Nature Communications, 9, 376. DeSantis, L.R.G., Tseng, Z.J., Liu, J., Hurst, A., Schubert, B.W., and Jiangzuo, Q. 2017. 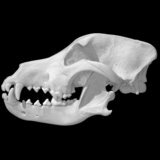 Assessing niche conservatism using a multiproxy approach: dietary ecology of extinct and extant spotted hyenas. Paleobiology, 43, 286-303. Dong, L., Xu, X., Wang, Y., and Evans, S.E. 2018. 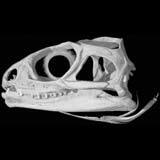 The lizard genera Bainguis and Parmeosaurus from the Upper Cretaceous of China and Mongolia. Cretaceous Research, 85, 95-108. Ercoli, M.D. 2017. 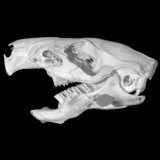 Morpho-functional analysis of the mastoid region of the extinct South American mustelid Stipanicicia pettorutii. Earth and Environmental Science Transactions of the Royal Society of Edinburgh, 106, 337-349. Evers, S.W., and Benson, R.B.J. 2019. A new phylogenetic hypothesis of turtles with implications for the timing and number of evolutionary transitions to marine lifestyles in the group. Palaeontology, 62, 93-134. Fabbri, M., Koch, N.M., Pritchard, A.C., Hanson, M., Hoffman, E., Bever, G.S., Balanoff, A.M., Morris, Z.S., Field, D.J., Camacho, J., Rowe, T.B., Norell, M.A., Smith, R.M., Abzhanov, A., and Bhullar, B-A.S. 2017. 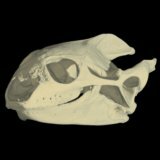 The skull roof tracks the brain during the evolution and development of reptiles including birds. Nature Ecology & Evolution, 1, 1543-1550. Feigin, C.Y., Newton, A.H., Doronina, L., Schmitz, J., Hipsley, C.A., Mitchell, K.J., Gower, G., Llamas, B., Soubrier, J., Heider, T.N., Menzies, B.R., Cooper, A., O'Neill, R.J., and Pask, A.J. 2018. 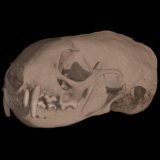 Genome of the Tasmanian tiger provides insights into the evolution and demography of an extinct marsupial carnivore. Nature Ecology & Evolution, 2, 182-192. Ferreira-Cardoso, S., Delsuc, F., and Hautier, L. In press. 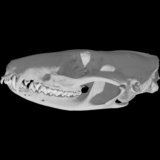 Evolutionary tinkering of the mandibular canal linked to convergent regression of teeth in placental mammals. Current Biology. Figueirido, B., Lautenschlager, S.,Pérez-Ramos, A., and Van Valkenburgh, B. 2018. 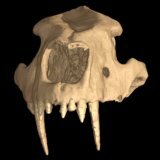 Distinct predatory behaviors in scimitar- and dirk-toothed sabertooth cats. Current Biology, 28, 3260-3266.e3. Fisher, M., and Hunter, E. 2018. 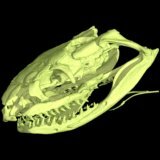 Digital imaging techniques in otolith data capture, analysis and interpretation. Marine Ecology Progress Series, 598, 213-231. Frey, S., and Ertl, T. 2017. Progressive direct volume-to-volume transformation. IEEE Transactions on Visualization and Computer Graphics, 23, 921-930. Henzler, P., Rasche, V., Ropinski, T., and Ritschel, T. 2018. 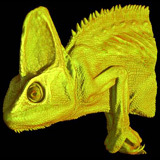 Single-image tomography: 3D volumes from 2D cranial X-rays. Computer Graphics Forum, 37, 277-388. Hoang, D., Klacansky, P., Bhatia, H., Bremer, P.-T., Lindstrom, P., and Pascucci, V. 2019. A study of the trade-off between reducing precision and reducing resolution for data analysis and visualization. IEEE Transactions on Visualization and Computer Graphics, 25, 1193-1203. Jung, J.-Y., Pissarenko, A., Yaraghi, N.A., Naleway, S.E., Kisailus, D., Meyers, M.A., and McKittrick, J. 2018. 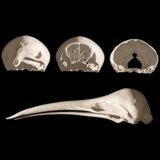 A comparative analysis of the avian skull: woodpeckers and chickens. Journal of the Mechanical Behavior of Biomedical Materials, 84, 273-280. Jung, J.-Y., Pissarenko, A., Trikanad, A.A., Restrepo, D., Su, F.Y., Marquez, A., Gonzalez, D., Naleway, S.E., Zavattieri, P., and McKittrick, J. In press. A natural stress deflector on the head? 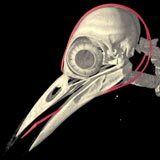 Mechanical and functional evaluation of the woodpecker skull bones. Advanced Theory and Simulations. Krubitzer, L.A., and Prescott, T.J. 2018. The combinatorial creature: cortical phenotypes within and across lifetimes. Trends in Neurosciences, 41, 744-762. Lautenschlager, S., Gill, P., Luo, Z.-X., Fagan, M.J., and Rayfield, E.J. 2017. 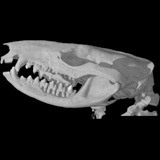 Morphological evolution of the mammalian jaw adductor complex. Biological Reviews, 92, 1910-1940. Lautenschlager, S., Gill, P.G., Luo, Z.-X., Fagan, M.J., and Rayfield, E.J. 2018. 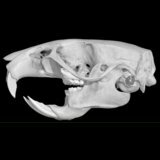 The role of miniaturization in the evolution of the mammalian jaw and middle ear. Nature, 561, 533-537. Lautenschlager, S., Ferreira, G.S., and Werneburg, I. 2018. 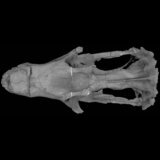 Sensory evolution and ecology of early turtles revealed by digital endocranial reconstructions. Frontiers in Ecology and Evolution, 6, 7. Ledogar, J.A., Luk, R.H.Y, Perry, J.M.G., Neaux, D., and Wroe, S. 2018. Biting mechanics and niche separation in a specialized clade of primate seed predators. PLoS ONE, 13(1), e0190689. Lessner, E.J., Gant, C.A., Hieronymus, T.L., Vickaryous, M.K., and Holliday, C.M. In press. 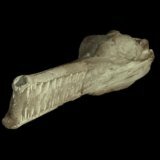 Anatomy and ontogeny of the mandibular symphysis in Alligator mississippiensis. The Anatomical Record. Loza, C.M., Latimer, A.E., Sánchez-Villagra, and Carlini, A.A. 2017. 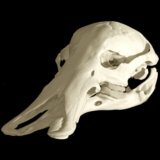 Sensory anatomy of the most aquatic of carnivorans: the Antarctic Ross seal, and convergences with other mammals. Biology Letters, 13, 20170489. McCurry, M.R., Evans, A.R., Fitzgerald, E.M.G., Adams, J.W., Clausen, P.D., and McHenry, C.R. 2017. 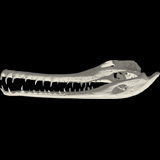 The remarkable convergence of skull shape in crocodilians and toothed whales. Proceedings of the Royal Society B, 284, 20162348. McCurry, M.R., Walmsley, C.W., Fitzgerald, E.M.G., and McHenry, C.R. 2017. 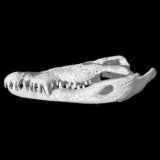 The biomechanical consequences of longirostry in crocodilians and odontocetes. Journal of Biomechanics, 56, 61-70. Melstrom, K.M. 2017. 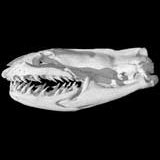 The relationship between diet and tooth complexity in living dentigerous saurians. Journal of Morphology, 278, 500-522. Ollonen, J., Da Silva, F.O., Mahlow, K., and Di-Poï, N. 2018. 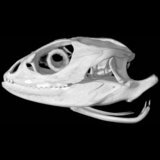 Skull development, ossification pattern, and adult shape in the emerging lizard model organism Pogona vitticeps: a comparative analysis with other squamates. Frontiers in Physiology, 9, 278. Palci, A., Hutchinson, M.N., Caldwell, M.W., and Lee, M.S.Y. 2017. 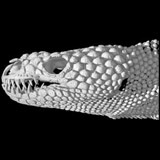 The morphology of the inner ear of squamate reptiles and its bearing on the origin of snakes. Royal Society Open Science, 4, 170685. Peredo, C.M., Pyenson, N.D., Uhen, M.D., and Marshall, C.D. 2017. 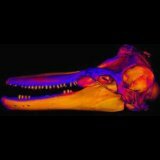 Alveoli, teeth, and tooth loss: understanding the homology of internal mandibular structures in mysticete cetaceans. 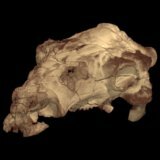 PLoS ONE, 12(5), e0178243. Pierce, S.E., Williams, M., and Benson, R.B.J. 2017. 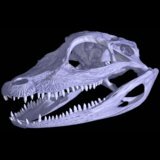 Virtual reconstruction of the endocranial anatomy of the early Jurassic marine crocodylomorph Pelagosaurus typus (Thalattosuchia). PeerJ, 5, e3225. Reich, M., Sprinkle, J., Lefebvre, B., Rössner, G.E., and Zamora, S. 2017. 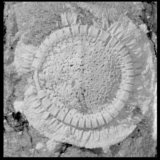 The first Ordovician cyclocystoid (Echinodermata) from Gondwana and its morphology, paleoecology, taphonomy, and paleogeography. Journal of Paleontology, 91, 735-754. Reynaga, C.M., Astley, H.C., and Azizi, E. 2018. 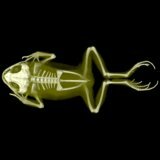 Morphological and kinematic specializations of walking frogs. Journal of Experimental Zoology, 329, 87-98. Rossie, J.B., Smith, T.D., Beard, K.C., Godinot, M., and Rowe, T.B. 2018. Nasolacrimal anatomy and haplorhine origins. Journal of Human Evolution, 114, 176-183. Santos, F.J.M., and Reis, R.E. 2018. Two new blind snake species of the genus Liotyphlops Peters, 1881 (Serpentes: Anomalepididae), from central and south Brazil. Copeia, 106, 507-514. Schneider, J., and Rautek, P. 2017. A versatile and efficient GPU data structure for spatial indexing. IEEE Transactions on Visualization and Computer Graphics, 23, 911-920. Schweizer, A.V., Lebrun, R., Wilson, LA.B., Costeur, L., Schmelzle, T. and Sánchez-Villagra, M.R. 2017. 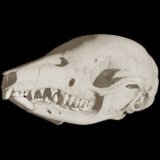 Size variation under domestication: conservatism in the inner ear shape of wolves, dogs and dingoes. Scientific Reports, 7, 13330. Serrano-Martinez, A., Knoll, F., Narváez, I., Lautenschlager, S., and Ortega, F. 2018. 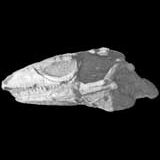 Inner skull cavities of the basal eusuchian Lohuecosuchus megadontos (Upper Cretaceous, Spain) and neurosensorial implications. Cretaceous Research, 93, 66-77. Stayton, C.T. 2018. 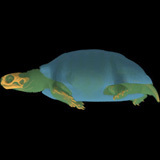 Warped finite element models predict whole shell failure in turtle shells. Journal of Anatomy, 233, 666-678. Theofanopoulou, C., Gastaldon, S., O'Rourke, T., Samuels, B.D., Messner, A., Martins, P.T., Delogu, F., Alamri, S., and Boeckx, C. 2017. Self-domestication in Homo sapiens: insights from comparative genomics. PLos ONE, 12(10), e0185306. Tseng, Z.J., and Flynn, J.J. 2018. Structure-function covariation with nonfeeding ecological variables influences evolution of feeding specialization in Carnivora. Science Advances, 4, 2. Vlachos, E., and Rabi, M. 2018. 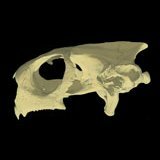 Total evidence analysis and body size evolution of extant and extinct tortoises (Testudines: Cryptodira: Pan-Testudinidae). Cladistics, 34, 652-683. Voeten, D.F.A.E., Reich, T., Araújo, R., and Scheyer, T.M. 2018. 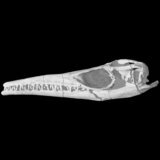 Synchrotron microtomography of a Nothosaurus marchicus skull informs on nothosaurian physiology and neurosensory adaptations in early Sauropterygia. 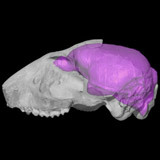 PLoS ONE, 13(1), e0188509. Wible, J.R., Shelley, S.L., and Rougier, G.W. 2018. 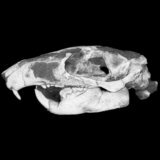 The mammalian parasphenoid: its occurrence in marsupials. Annals of Carnegie Museum, 85, 113-164. Yi, H., and Norell, M. In press. 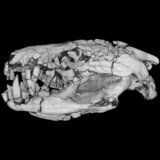 The bony labyrinth of Platecarpus (Squamata: Mosasauria) and aquatic adaptations in squamate reptiles. Palaeoworld. Young, N.M., Linde-Medina, M., Fondon, J.W., Hallgrímsson, B., and Marcucio, R.S. 2017. 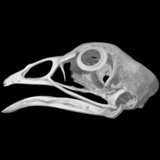 Craniofacial diversification in the domestic pigeon and the evolution of the avian skull. Nature Ecology & Evolution, 1, 0095. Zwicker, D., Ostilla-Mónico, R., Lieberman, D.E., and Brenner, M.P. 2018. Physical and geometric constraints shape the labyrinth-like nasal cavity. Proceedings of the National Academy of Sciences, 115, 2936-2941.